A smile makeover is a dental treatment designed to transform your smile and give it a more pleasing appearance. Generally, patients prefer to have their smile made brighter, straighter, broader or more youthful-looking. A smile makeover can also be a great option to simply restore aged and worn-down teeth to how they used to look and feel many years ago. The results are completely customized for each patient and your specific goals. A series of porcelain restorations such as dental veneers and crowns are often used to create your new smile. Dental implants, bridges or other restorations are routinely used to replace any missing teeth as well. A smile makeover uses the strongest, most aesthetic dental materials and techniques to give your smile the very best appearance, comfort and longevity. Every smile makeover is an original masterpiece. How do I know what my new smile will look like? After discussing how you would like to improve your smile with Dr. Morhaliek, we begin the smile design process. 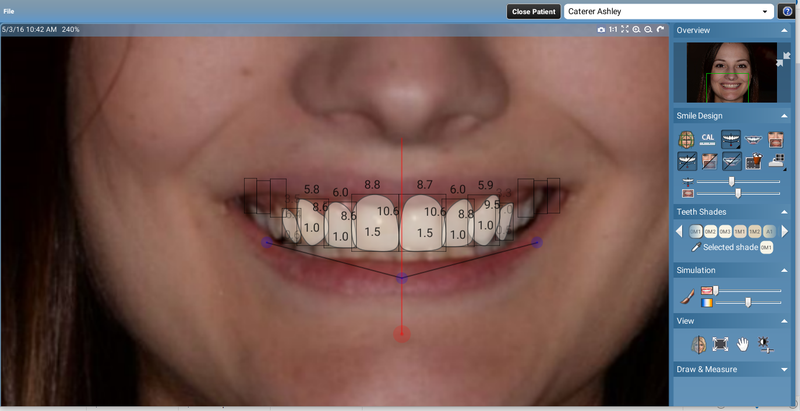 Using digital models of your teeth and special computer software, we reshape your teeth on the virtual models. We shape them to be longer, straighter, more proportioned or whatever you choose, based on recognized smile design principles for beautiful dental aesthetics. Your new smile can be viewed right on a computer screen and modified as required until the perfect look is achieved. Next, your new smile is then made into a temporary version or "trial-smile" that you actually get to wear to see how it looks and feels. Modifications can then be made yet again before manufacturing the final restorations. This method is very helpful because you get to test drive your new smile before you actually receive it, making for predictably beautiful results and highly successful treatment outcomes. View a sampling of our recent smile makeovers here. There is no pain when you have a smile makeover at Simply Amazing Smiles. All procedures are performed under local anaesthetic, just the same as with small fillings and other minor dental work. Minor and temporary discomfort may be experienced during the provisional restoration stage following your intital visit. Most patients feel no discomfort during this time at all. Upon reviewing the different options to acheive your dream smile, we will present the estimated dental fees. Depending on how many teeth you choose to restore as part of your smile makeover, the fee will vary. Generally, fees are related to the number of teeth that are treated. Typical smile makeovers include anywhere from 2 to 28 teeth. Our fees are very competitive yet also reflect the value of the quality and workmanship, the experience and the knowledge of Dr. Morhaliek and his highly skilled team. Dr. Morhaliek has been involved in learning, providing these treatments and teaching advanced smile design treatments for many years. Dr. Morhaliek is extremely qualified to provide your amazing smile makeover.